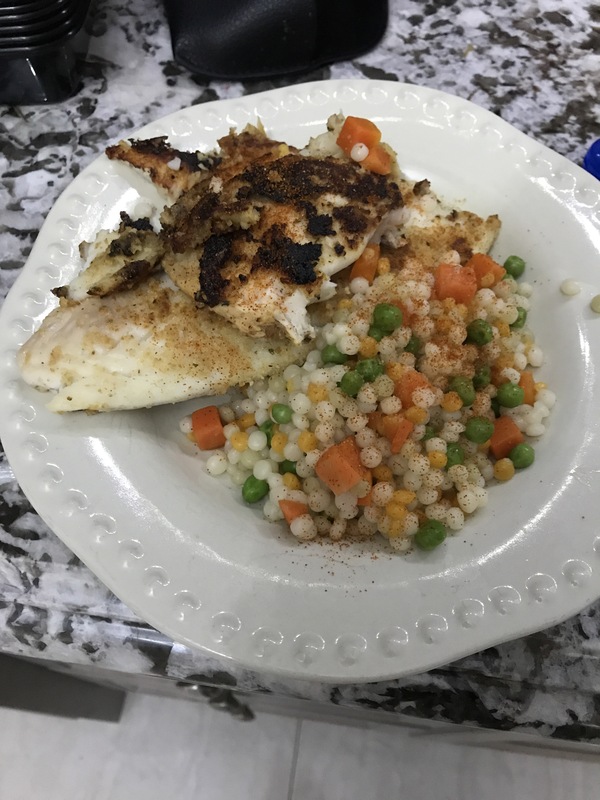 White fish cooked in lemon butter with couscous and mixed veggies. 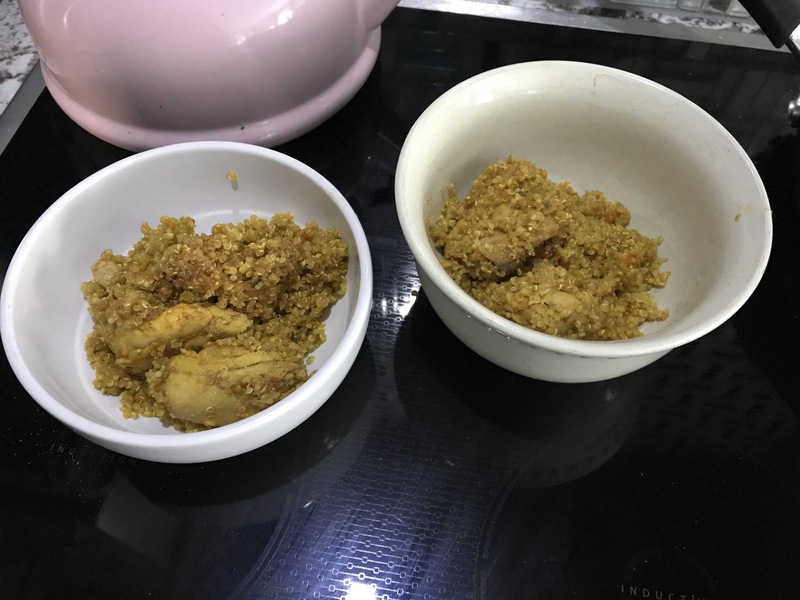 This one I pan fried the fish in the juice of one lemon and half a stick of butter, I just dipped them in breadcrumbs (since I don’t use eggs) and made the couscous and veggies in another pot at the same time. I used one package of frozen veggies the carrots and peas mix. 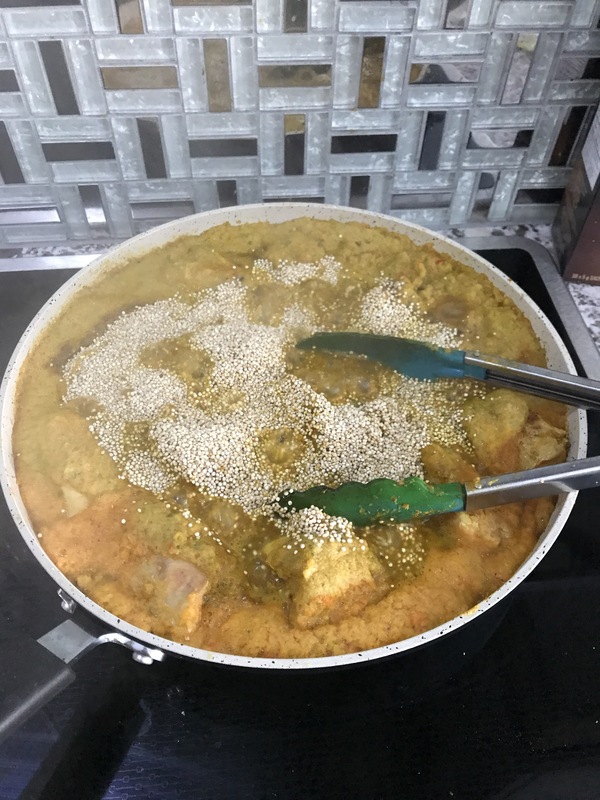 Couscous is super easy to make, if you have some tomato sauce laying around it would taste really nice on top of the couscous and veg mix. That’s it, super simple. Follow the directions on the box for couscous and throw the veggies in at the same time bring to a boil, cover and let sit. Chicken thighs with quinoa in a red pepper sauce (one-pot meal). This I sautéed the chicken thighs in my new non stick pan with butter, turmeric and garlic and minced half a red onion. I puréed three peppers and once the chicken was browned I threw in the puréed peppers and 1 and half cups of quinoa, covered it and simmered it for approximately 15 mins. If the quinoa isn’t soft and fluffy at the end of the 15 then add a cup more water, stir it and cover again for 7 mins. Repeat that as necessary until the quinoa is fluffy! Serve it with cheese for the kiddos and hot sauce or cayenne pepper for the adults! 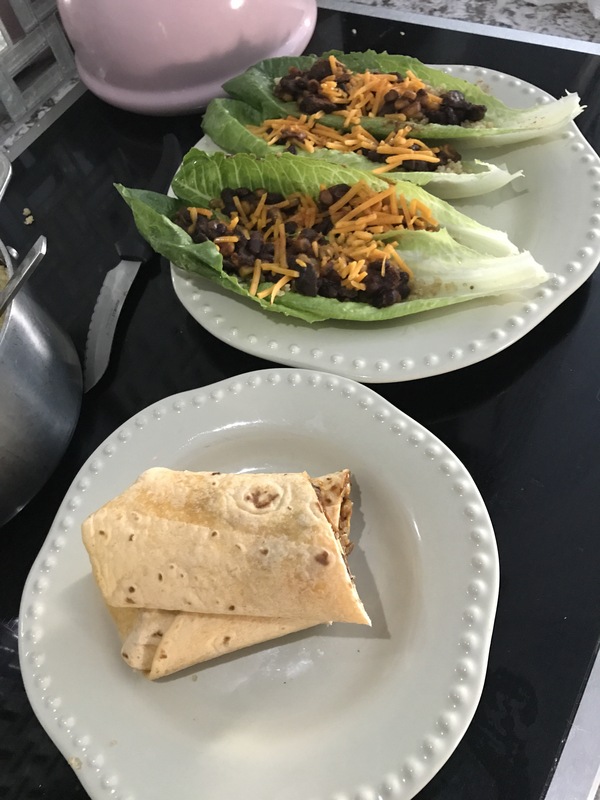 Vegetarian black bean chilly in lettuce wraps for the adults, and cheddar tortilla wraps for the kids. 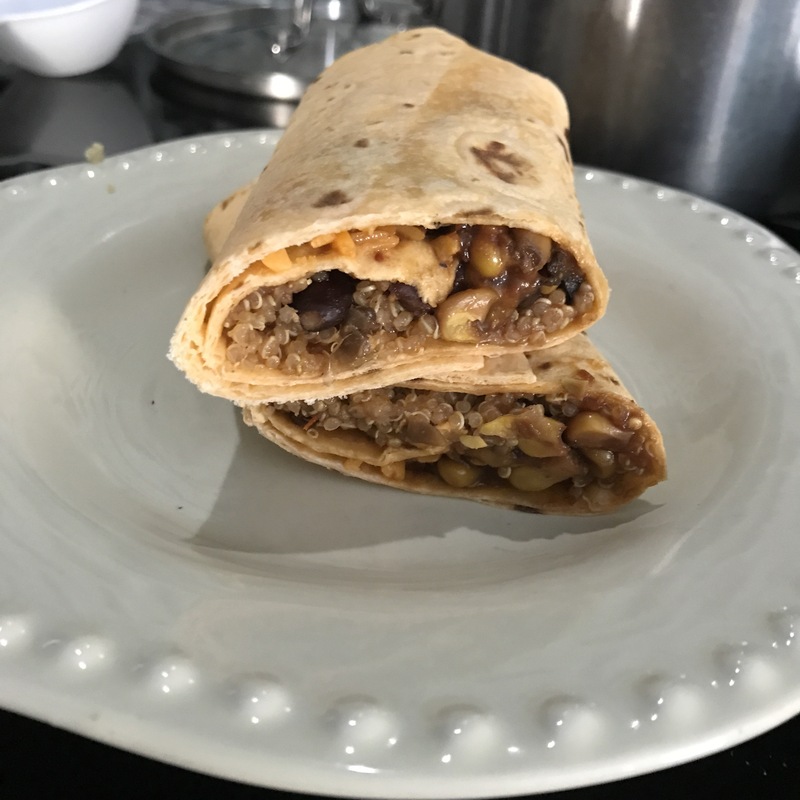 I mean was my masterpiece for the week, made in the instant pot! 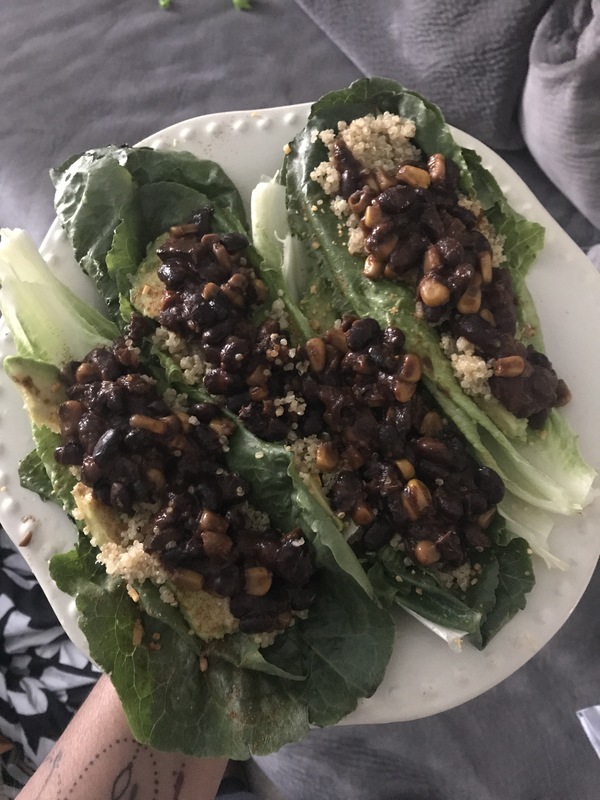 I soaked a whole bag of black beans or approx 3 and 1/2 cups in a bowl for 30 mins. I sautéed minced garlic, red onion, and mushroom and garlic salt, onion powder, turmeric, and cayenne. Once sautéed I added puréed Roma tomatoes (I’ve also made this with a jar of tomato sauce) and then added frozen organic corn. Covered the instant pot and set to chilli. While that was happening I made two cups of quinoa with vegetable stock! 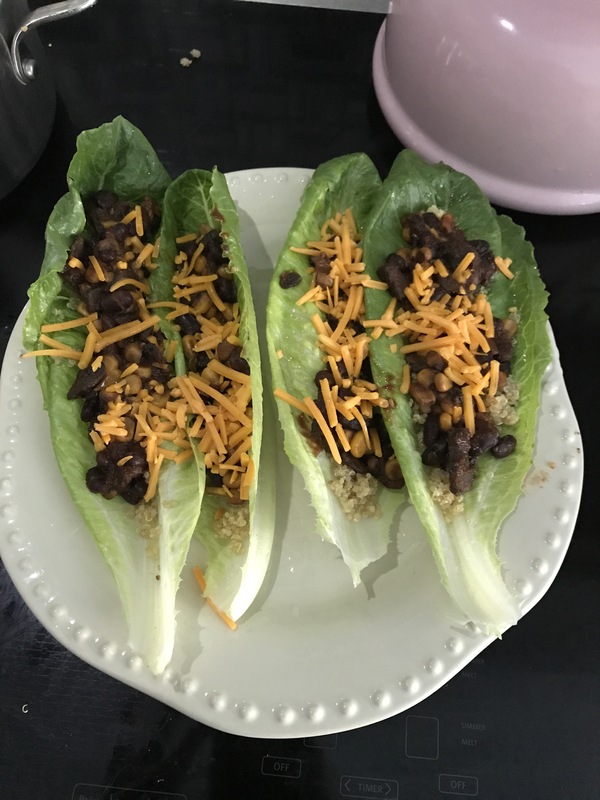 For the adults I served this on top of lettuce sprinkled with pepper, avocado slices then quinoa and the chilli on top sprinkled with cheese and a small bit of Greek yogurt. The kids I did in a cheddar wrap, they ate it and asked for more. 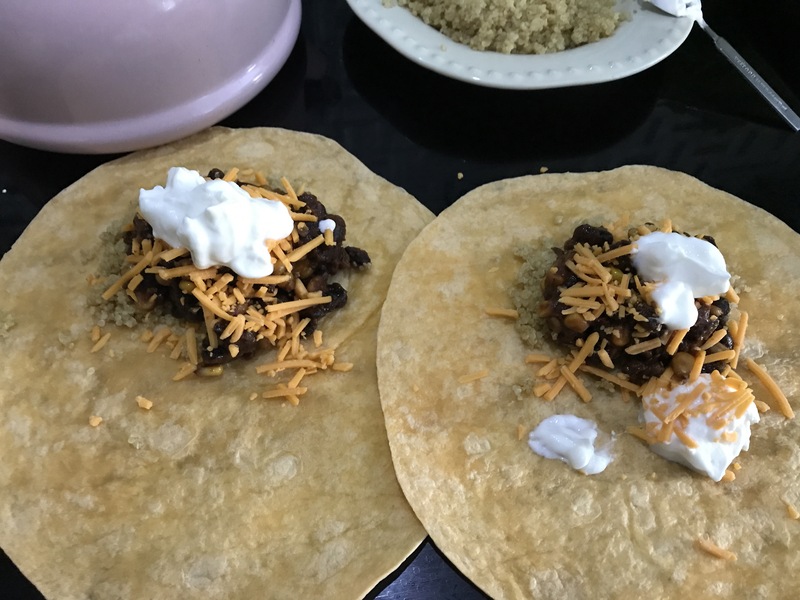 We also ate this on leftover day, and today for dinner! Winner, winner, vegetarian dinner!!! This was easy since I had my seasoning made, which consists of garlic powder, onion powder, garlic salt, sea salt, turmeric, and cayenne pepper. I browned the ground beef in butter and red onions garlic and seasoning. 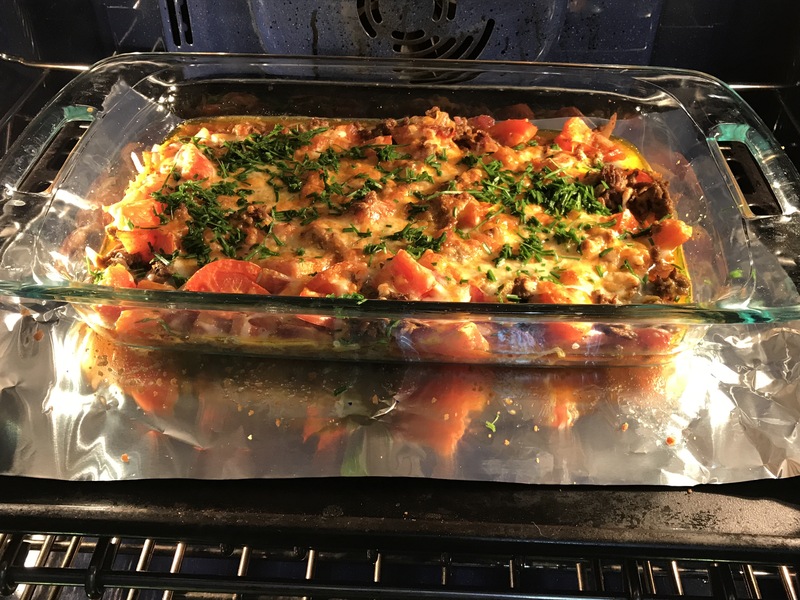 Then threw it in a casserole dish, threw in chopped Roma tomatoes, package of shredded cheese, and chives I grew and baked it for 30 mins at 350degrees. You could serve it over rice, or even leftover quinoa! This really helped me in the week not to be stressed and well fed. In case you didn’t already pick up on this, I use whole fat ingredients for myself and the family. It’s very close to the Keto or Paleo Diet, and I do personally take from them for myself alone, but I don’t make my kids eat super clean. Unfortunately tree nuts and eggs are basically in everything so I am forced to make almost everything from scratch.